Today I was searching for a local business on Google and in the SERPs spotted an interesting link so went to look. Rather than finding myself on someone’s business website I was actually on a Google Plus Local Page (not sure what that correct name for this is at the moment). In the past Google would display Local results above, or separate, from the main organic results, and these would be of the standard Local / Maps format. Now some entries have their Google Plus page listed instead (or maybe as well as in some cases), and this is listed as a normal website. 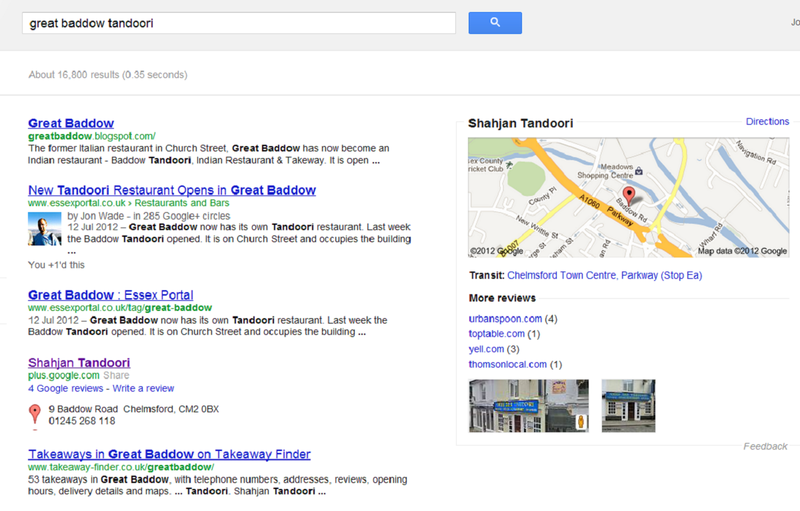 The search I performed was actually for [Great Baddow tandoori], a new Indian restaurant in my neck of the woods. I wrote about it the other day and was surprised to see that the page was getting some traffic so took a look. It seems that they do not have a website, so my blog post is one of the first ones in Google (see screenshot below – I guess people outside of this area will get totally different search results). Note that the third result is for plus.google.com. This is not the new local tandoori, but another which is in town, but on Baddow Road in Chelmsford, as opposed to in Great Baddow itself. Maybe if the local Indian restaurants had Google Local listings then they would appear first – a quick check for hairdressers in the area shows that Google Places is still working as normal. That’s it really, just an observation. What is interesting is that a Google.com page is listed so highly. Maybe the future for small businesses is Google now – invest a day building a nice Google Plus page for business rather than dishing out hundreds or thousands of pounds for a web designer to build a website that will not rank in the organic results. The web is changing, and Google are set to be owning it! ← What Is Natural Link Building? Is all SEO Unnatural?